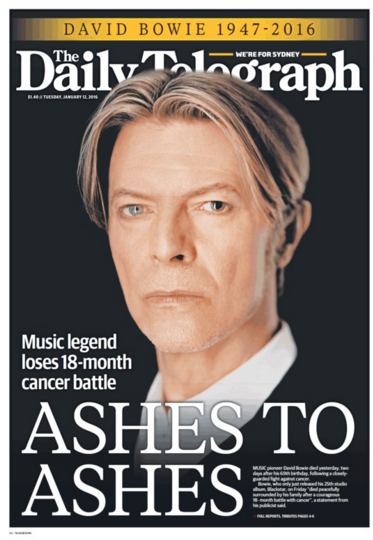 However you have to feel bad for the New York Times which, according to Boing Boing, went to print with a story noting Bowie’s birthday and a lead that read: “It’s a good time to be David Bowie” but failed to note his death (ignore the Stan ad). “Ashes to Ashes” by the Daily Smellagraph comic book is “simply but elegant”? More like simply trashy, but that’s to be expected. Yes, the Courier-Mail, to give them their due, wins. 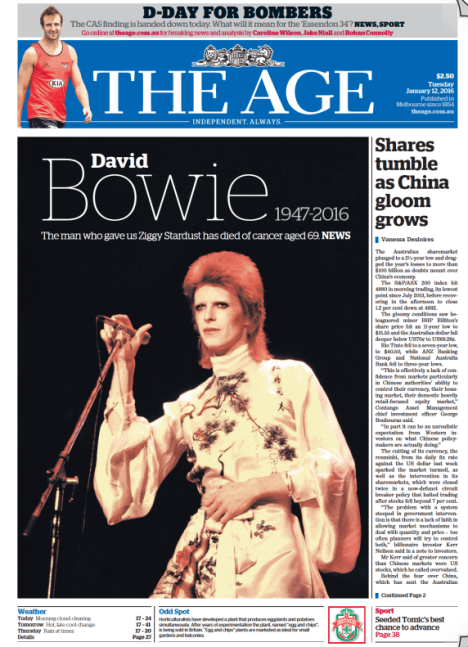 was it such a slow news day that these papers gave their front pages over to the death of a singer? A British singer living in NY? Wow!! @fading sub. Not only that but a singer who deflowered a 13 year old groupie. He’s in the same league as Rolf Harris and Ian Watkins, but his fans are quick to cover up that episode and the media ignore it.